Is there a better alternative to Master Math Word Problems? Is Master Math Word Problems really the best app in Mathematics category? Will Master Math Word Problems work good on macOS 10.13.4? Master Math Word Problems is an easy-to-use program to aid students in learning to identify key words that identify mathematical operations and work through mathematical word problems. Word problems are considered important because they take math into the real world. Unfortunately solving word problems is one of the areas where students have the most difficulties in elementary math. Master Math Word Problems helps students develop word problem skills through practice. It features optional on screen tips and three practice modes. Results of each round as well as missed questions may be printed with student name and time/date stamp. Master Math Word Problems needs a review. Be the first to review this app and get the discussion started! Master Math Word Problems needs a rating. Be the first to rate this app and get the discussion started! 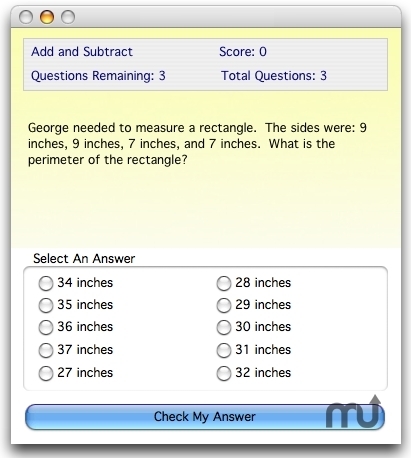 Master Math Word Problems is an easy-to-use program to aid students in learning to identify key words that identify mathematical operations and work through mathematical word problems. Word problems are considered important because they take math into the real world. Unfortunately solving word problems is one of the areas where students have the most difficulties in elementary math. Master Math Word Problems helps students develop word problem skills through practice. It features optional on screen tips and three practice modes. Results of each round as well as missed questions may be printed with student name and time/date stamp. Randomization of components within a word problem framework allows for extended practice without students seeing identical problems repeatedly.